Benzinga’s Tim Parker asks the best questions. 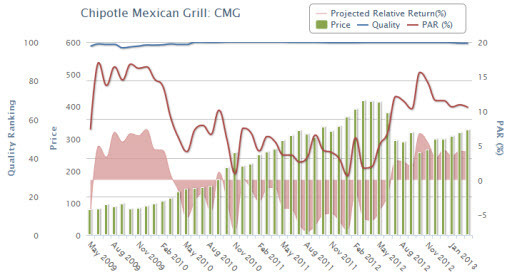 See: Chipotle, Buy Sell or Hold — Order Up! 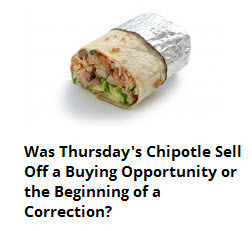 As Tim points out, noted and notable investing celebrities David Einhorn and Jeff Gundlach both have questioned the future of Chipotle. In fact, they diss the burrito bonanza and compare Chipotle to Taco Bell, hissing a little while they nudge the guacamole around on their plates. I question whether either of them have ever been to a Chipotle. The restaurants are pretty spartan … and last time I checked, there wasn’t any sign of wait staff adorned with towel over arm, refilling my water glass every time I take a sip. Maybe it’s the styrofoam vs. glass which makes it a little more challenging to detect water level? Nothing against either one of these guys … not at all. They’re both great sources of ideas and inspiration and they both have a 3-taco plate full of notable achievements. But here I have to go with the college students and long lines forming at Chipotle to think that perhaps — just maybe — they’re a smidge wrong about this one. Our take: Hold with a return forecast that’s pretty close to the average return for all stocks. (6-7%). And given the Speedy Gonzalez behavior and life cycle position of Chipotle, we’ll expect a siesta or two going forward… and yes, things will calm down over time. It’s a natural thing. And when it does, the stock price gets adjusted like a palate recovering from a hot sauce barrage from time to time. As Tim suggests, the technical rendition looks pretty good. 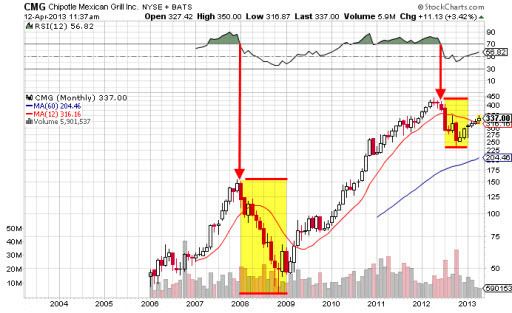 Here’s the really long-term look, focusing on monthly characteristics. There’s no clear and present danger of an RSI break (unlike the previous chapters) right now.